Many know the fundamentals to building a solid financial foundation are “spend less than you earn” and “save! save! save!” (I am sure there are a few more you could add :)). It is with these fundamentals mixed with some killer content written by personal finance bloggers that can help to build a solid win-win financial future. Content anywhere from how to invest in the stock market to cutting our daily expenses. Today we will look into some of the blog posts written by some keen personal finance writers discussing all sorts of great subjects; taxes, investing, negotiating, outsourcing… The list goes on. Since Financial Samurai has me thinking about using Certificates of Deposits as a route for investing, Personal Finance Student has a great article listing the The Advantages and Disadvantages of CDs. Nicely done. Rainy Day Saver’s post, Do You Have to Give Up Convenience in Order to Save Money?, looks at making cut backs with convenient services or goods for a better financial future. Stay at Home Mom CFO looks at how Getting a BIG Tax Refund was Keeping us in Debt. Interesting article. I have to say that I am starting to think I don’t want a refund check going forward. I think that money might sit better in my 401K. Young and Thrifty is out to serve the rights for Canadians. See her pull out the big guns against Rogers in, Step-by-step Guide on How to Save Money on Your Cell Phone Contract. My Money Minute wants to know, Tax Refunds: Does Size Matter? In a not so ideal world, big tax refunds are not such a horrible thing after all. Chasing Prosperity has a lyrical fun post looking at, Thriftygal’s Top Ten Money Tunes (Feb. 8th post). Gotta say, I love Donna Summer’s “I work hard for the money”. How to Peacefully Split Bills in Your Relationship by Foreigner’s Finance spoke my tune as my husband and I decided separate the bank accounts. The Amateur Financier wants to know your thoughts about Taxing Financial Transactions: Good Idea or Not? As a passive investor he likes this plan. Do you agree? Which Way are You Outsourcing? by Engineer Your Finances, is a great article! Since I want to outsource areas in my life, this will serve as an effective tool to determine if I am UPsourcing or DOWNsourcing. WHICH WAY you are outsourcing? Couple Money has family financial meetings. I think that is a great idea! In Elle’s post called, Cash Flow: Managing and Improving Ours, she writes about Increasing your Income, Optimizing Your Expenses and Which Software Can Help. Great job! Frugal Zeitgeist did a great piece called, Save Money on Printing. I never new about Eco Font and that it uses about half the ink of conventional fonts. Very cool! Deliver Away Debt learned that he should be claiming 8 in How to Adjust Tax Withholdings. What’s he going to do with that money Sam was holding interest free for him? Dump it into his snowball! Monevator wants you to Get out of debt to unleash your inner money maker. I agree, I want my “month’s salary is going wherever I want it to go” and “not on paying for things bought and forgotten about years ago”. Evolution of Wealth discusses the changes that have come about in the life insurance industry in, Whole Life Insurance is Stackable. Easy Ways to Improve Your Memory is well written by MBA Briefs. I like that a better memory could greatly improve your income potential. Read on! Eliminate the Muda offers some advice in Dealing with Debt Collection. As a former debt collector… yup, we like to bug you and try tactics, but as a consumer you still have rights not to be harrassed. Learn them here. The “Secrets” to Landing Guest Posts is a great piece by Experiments in Passive Income. Especially for all you challengers looking to forge new connections in the blog-o-sphere! This entry was posted in Finances and tagged outsource, taxes on 2010-02-26 by Christine. If you enjoyed today's post and want to get the latest updates from the Money Funk personal finance blog, please subscribe to the RSS feed or by email. Thanks for the link love! I don’t know anyone who’s even put 20% down on a house (besides us!). That’s a LOT of reading 😉 Hope you’re having a good Friday. Thanks for the link love Money Funk! You’re awesome. You duked them fists in the post. LOL. Great job. I hope you are having an amazing weekend, too. Me? I worked my Saturday but got SOOOOO much accomplished. I feel awesome about it! PS I like your cartoon! 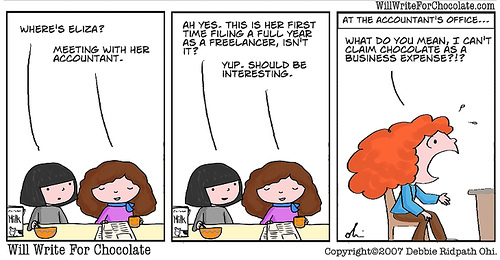 =) I wish chocolate could be a business expense too. Can’t we write that as an entertainment expense? LOL. Thanks for the link, Money Funk. Tax season is mid-year here and I just realised that we both have the tax season in winter. What’s up with that? As for the size of tax refund, suffice to say that I want my money back from the government as much as I can. We don’t have vahttp://www.moneyfunk.net/finances/weekly-round-up-tax-season/rious payment options like you do there though. Most of my friends (not that many to start with ;)) have sizable down payment to their house, but not because they’re avid savers. They’re “lucky” to have rich parents who throw in $100k-$200K to buy the house. The downside is they end up buying large house with big mortgage and will never have the parents off their backs. That’s a perfect example of money to freedom (or lack thereof) exchange. Oh! I wish I had parents who would throw down like that. But of course, I would be savvy to by me a place that fits my needs. All our friends bought bigger and many have unfortunately walk away from their homes. Long time to bring that credit history up to par. What, I got to file an amended return now? I claimed the chocolate too! Thanks so much for highlighting one of my posts. Coming from an expert in the field I especially appreciate it! Expert, huh? LOL. Did I tell you that I just felt terrible debt collecting large hospital bills from people who clearly don’t have the money to pay the balance, that I got up one day, walked to the supervisor, told her, “I quit” and walked out never to look back? Shame. Healthcare needs to be adequately available for everyone. Didn’t know you were a debt collector C! Maybe I read it on Ryan’s site before but I forgot. The good thing about owing taxes, is that you can just put it off until the very end and not worry about it. Wheeee. I have quite an eclectic array of jobs there, don’t I? LOL. Like Sam, I loved the cartoon. It’s new to me. My favorite post of the round-up was the Money Tunes at Chasing Prosperity. Several old oldies but goodies (like me!). You are welcome. Want some chocolate?? ?